This course covers concepts and techniques for the design and implementation of large software systems that can be adapted to uses not anticipated by the designer. Applications include compilers, computer-algebra systems, deductive systems, and some artificial intelligence applications. Topics include combinators, generic operations, pattern matching, pattern-directed invocation, rule systems, backtracking, dependencies, indeterminacy, memoization, constraint propagation, and incremental refinement. Substantial weekly programming assignments are an integral part of the subject. There will be extensive programming assignments, using MIT/GNU Scheme. Students should have significant programming experience in Scheme, Common Lisp, Haskell, CAML or some other "functional" language. 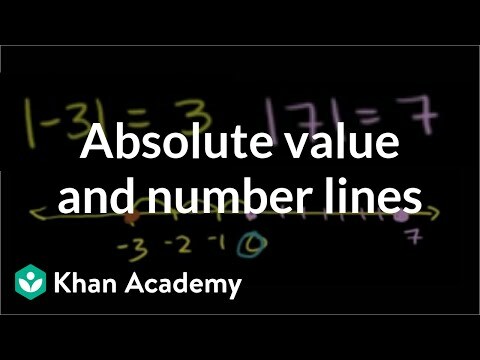 The foundations of Algebra from The Khan Academy. This free online course in algebra from ALISON will guide you through among other things expressions, systems of equations, functions, real numbers, inequalities, exponents, polynomials, radical and rational expressions. The course is divided into 12 chapters and each chapter is divided into several lessons. Under each lesson you will find theory, examples and video lessons. This course is ideal for learners who want to study topics in algebra in detail. El álgebra nos permite organizar información a través de variables para representar de forma abstracta situaciones de la vida real y por esto es importante conocer cómo se comportan dichas variables. This undergraduate level Algebra I course covers groups, vector spaces, linear transformations, symmetry groups, bilinear forms, and linear groups. This undergraduate level course follows Algebra I. Topics include group representations, rings, ideals, fields, polynomial rings, modules, factorization, integers in quadratic number fields, field extensions, and Galois theory. This free online course offers a comprehensive introduction to algebra and carefully explains the concepts of algebraic fractions. It guides you from basic operations, such as addition and subtraction, up to simplifying quadratic equations and more. It applies maths to real-world problems. This course is ideal for students looking for extra help, or even for a different approach to learning maths. El Álgebra Lineal es una parte esencial en la formación matemática de todo científico, administrador e ingeniero, pues sus aplicaciones son numerosas en las áreas de física, química, ingeniería biomédica, gráficas computarizada, procesamiento de imágenes, optimización de procesos, entre muchas otras. Al final del curso serás capaz de resolver sistemas de ecuaciones, involucrados en muchos problemas académicos y del ámbito profesional. El diseño de este curso, está orientado a proporcionarte las herramientas necesarias para un mejor desempeño en el aprendizaje de estos temas. Contarás para ello con notas de apoyo en formato electrónico (PDF) de la materia, videos tutoriales, que te mostrarán paso a paso como obtener la solución de los ejemplos planteados, Applets interactivos para reforzar la comprensión geométrica de los conceptos algebraicos, autoevaluaciones en línea para registrar tu avance y foros de discusión entre usuarios. Understanding absolute value and solving absolute value equations and inequalities. Absolute Value and Number Lines. Absolute Value 1. Absolute Value of Integers. Comparing Absolute Values. CA Algebra I: Number Properties and Absolute Value. Absolute Value Equations. Absolute Value Equations Example 1. Absolute Value Equation Example 2. U02_L2_T2_we1 Absolute Value Equations.avi. Absolute Value Inequalities. Absolute value inequalities Example 1. Absolute Inequalities 2. Absolute value inequalities example 3. Select problems from ck12.org's Algebra 1 FlexBook (Open Source Textbook). This is a good playlist to review if you want to make sure you have a good understanding of all of the major topics in Algebra I. Variable Expressions. Order of Operations Example. Patterns and Equations. Equations and Inequalities. Domain and Range of a Function. Functions as Graphs. Word Problem Solving Plan 1. Word Problem Solving Strategies. Integers and Rational Numbers. Addition of Rational Numbers. Subtraction of Rational Numbers. Multiplication of Rational Numbers. Distributive Property Example 1. Division of Rational Numbers. Square Roots and Real Numbers. Problem Solving Word Problems 2. One Step Equations. Two-Step Equations. Ex 1: Distributive property to simplify . Ex 3: Distributive property to simplify . Ratio and Proportion. Scale and Indirect Measurement. Percent Problems. Another percent example. The Coordinate Plane. Graphing Using Intercepts. Graphs of Linear Equations. Slope and Rate of Change. Graphs Using Slope-Intercept Form. Direct Variation Models. Function example problems. Word Problem Solving 4. Linear Equations in Slope Intercept Form. Linear Equations in Point Slope Form. Linear Equations in Standard Form. Equations of Parallel and Perpendicular Lines. Fitting a Line to Data. Predicting with Linear Models. Using a Linear Model. Inequalities Using Addition and Subtraction. Inequalities Using Multiplication and Division. Compound Inequalities. Absolute Value Equations. Absolute Value Inequalities. Graphing Inequalities. Solving Linear Systems by Graphing. Solving Linear Systems by Substitution. Solving Systems of Equations by Elimination. Solving Systems of Equations by Multiplication. Special Types of Linear Systems. Systems of Linear Inequalities. Exponent Properties Involving Products. Exponent Properties Involving Quotients. Zero, Negative, and Fractional Exponents. Scientific Notation. Exponential Growth Functions. Exponential Decay Functions. Geometric Sequences (Introduction). Word Problem Solving- Exponential Growth and Decay. Addition and Subtraction of Polynomials. Multiplication of Polynomials. Special Products of Binomials. Polynomial Equations in Factored Form. Factoring quadratic expressions. Factoring Special Products. Factor by Grouping and Factoring Completely. Graphs of Quadratic Functions. Solving Quadratic Equations by Graphing. Solving Quadratic Equations by Square Roots. Solving Quadratic Equations by Completing the Square. How to Use the Quadratic Formula. Proof of Quadratic Formula. Discriminant of Quadratic Equations. Linear, Quadratic, and Exponential Models. Identifying Quadratic Models. Identifying Exponential Models. Quadratic Regression. Shifting functions. Radical Expressions with Higher Roots. More Simplifying Radical Expressions. How to Rationalize a Denominator. Extraneous Solutions to Radical Equations. Radical Equation Examples. More Involved Radical Equation Example. Pythagorean Theorem. Distance Formula. Midpoint Formula. Visual Pythagorean Theorem Proof. Average or Central Tendency: Arithmetic Mean, Median, and Mode. Range, Variance and Standard Deviation as Measures of Dispersion. Stem and Leaf Plots. Histograms. Box-and-whisker Plot. Proportionality. Asymptotes of Rational Functions. Another Rational Function Graph Example. A Third Example of Graphing a Rational Function. Polynomial Division. 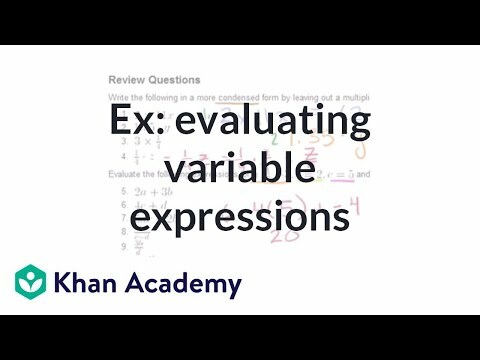 Simplifying Rational Expressions Introduction. Multiplying and Dividing Rational Expressions. Adding Rational Expressions Example 1. Adding Rational Expressions Example 2. Adding Rational Expressions Example 3. Solving Rational Equations. Two more examples of solving rational equations. Surveys and Samples. Identifying and graphing circles, ellipses, parabolas, and hyperbolas. 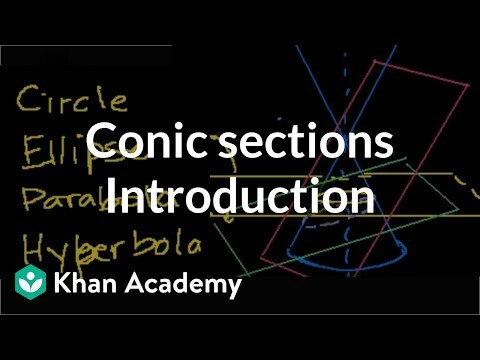 Introduction to Conic Sections. Recognizing conic sections. Conic Sections: Intro to Circles. Graphing circles. Equation of a circle in factored form. Completing the square to write equation in standard form of a circle. Equation of a circle in non-factored form. Graphing circles 2. Conic Sections: Intro to Ellipses. Equation of an ellipse. Foci of an Ellipse. Shifting and scaling parabolas. Parabola intuition example 1. Parabola intuition 1. Parabola Focus and Directrix 1. Focus and Directrix of a Parabola 2. Parabola intuition 2. Conic Sections: Intro to Hyperbolas. Conic Sections: Hyperbolas 2. Conic Sections: Hyperbolas 3. Equation of a hyperbola. Foci of a Hyperbola. Proof: Hyperbola Foci. Identifying an ellipse from equation. Identifying a hyperbola from an equation. Identifying circles and parabolas from equations. Hyperbola and parabola examples. Introduction to Conic Sections. Recognizing conic sections. Conic Sections: Intro to Circles. Graphing circles. Equation of a circle in factored form. Completing the square to write equation in standard form of a circle. Equation of a circle in non-factored form. Graphing circles 2. Conic Sections: Intro to Ellipses. Equation of an ellipse. Foci of an Ellipse. Shifting and scaling parabolas. Parabola intuition example 1. Parabola intuition 1. Parabola Focus and Directrix 1. Focus and Directrix of a Parabola 2. Parabola intuition 2. Conic Sections: Intro to Hyperbolas. Conic Sections: Hyperbolas 2. Conic Sections: Hyperbolas 3. Equation of a hyperbola. Foci of a Hyperbola. Proof: Hyperbola Foci. Identifying an ellipse from equation. Identifying a hyperbola from an equation. Identifying circles and parabolas from equations. Hyperbola and parabola examples. Solving exponential and radical expressions and equations. Using scientific notation and significant figures. Negative and Positive Exponents. Evaluating exponential expressions. Evaluating exponential expressions 3. Exponent Rules Part 1. Exponent Rules Part 2. Exponent Properties 1. Exponent Properties 2. Exponent Properties 3. Exponent Properties 4. Simplifying rational expression with exponent properties. Exponent Properties 5. Exponent Properties 6. Exponent Properties 7. Simplifying Square Roots. Simplifying Square Roots Comment Response. Radical Equivalent to Rational Exponents. Radical Equivalent to Rational Exponents 2. Radical Expressions with Higher Roots. Adding and Simplifying Radicals. Subtracting and Simplifying Radicals. Multiply and Simplify a Radical Expression 1. Multiply and Simplify a Radical Expression 2. Exponent Properties Involving Products. Rational Exponents and Exponent Laws. Simplifying Cube Roots. More Rational Exponents and Exponent Laws. How to Rationalize a Denominator. Simplifying Expressions with Exponents. 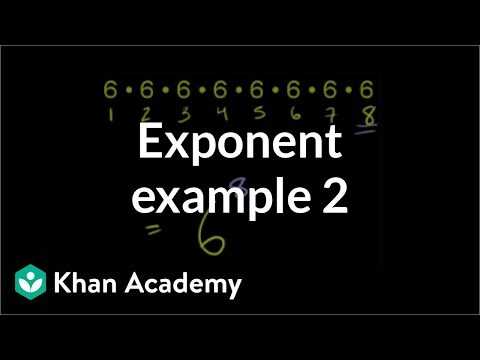 Simplifying Expressions with Exponents 2. Simplifying Expressions with Exponents 3. Fractional Exponent Expressions 1. Fractional Exponent Expressions 2. Fractional Exponent Expressions 3. Simplifying expressions with exponents. Solving Radical Equations. Extraneous Solutions to Radical Equations. Solving Radical Equations 1. Solving Radical Equations 2. Solving Radical Equations 3. Applying Radical Equations 1. Applying Radical Equations 2. Applying Radical Equations 3. Radical equations. Negative and Positive Exponents. Evaluating exponential expressions. Evaluating exponential expressions 3. Exponent Rules Part 1. Exponent Rules Part 2. Exponent Properties 1. Exponent Properties 2. Exponent Properties 3. Exponent Properties 4. Simplifying rational expression with exponent properties. Exponent Properties 5. Exponent Properties 6. Exponent Properties 7. Simplifying Square Roots. Simplifying Square Roots Comment Response. Radical Equivalent to Rational Exponents. Radical Equivalent to Rational Exponents 2. Radical Expressions with Higher Roots. Adding and Simplifying Radicals. Subtracting and Simplifying Radicals. Multiply and Simplify a Radical Expression 1. Multiply and Simplify a Radical Expression 2. Exponent Properties Involving Products. Rational Exponents and Exponent Laws. Simplifying Cube Roots. More Rational Exponents and Exponent Laws. How to Rationalize a Denominator. Simplifying Expressions with Exponents. Simplifying Expressions with Exponents 2. Simplifying Expressions with Exponents 3. Fractional Exponent Expressions 1. Fractional Exponent Expressions 2. Fractional Exponent Expressions 3. Simplifying expressions with exponents. Solving Radical Equations. Extraneous Solutions to Radical Equations. Solving Radical Equations 1. Solving Radical Equations 2. Solving Radical Equations 3. Applying Radical Equations 1. Applying Radical Equations 2. Applying Radical Equations 3. Radical equations. Identifying, solving, and graphing various types of functions. What is a function. Difference between Equations and Functions. Function example problems. Ex: Constructing a function. Understanding Function Notation Example 1). Understanding Function Notation Example 2). Understanding Function Notation Example 3). Understanding function notation. Testing if a relationship is a function. Graphical Relations and Functions. Functions as Graphs. Recognizing functions (example 1). Recognizing functions (example 2). Recognizing functions. Relations and Functions. Functional Relationships 1. Recognizing functions (example 3). Recognizing functions (example 4). Recognizing functions (example 5). Recognizing functions 2. Domain of a function. Domain and Range of a Relation. Domain and Range of a Function Given a Formula. Domain and Range 1. Domain of a Radical Function. Domain of a function. Domain and Range 2. Domain and Range of a Function. Range of a function. Domain and range from graphs. Domain and range from graph. Direct and Inverse Variation. Recognizing Direct and Inverse Variation. Proportionality Constant for Direct Variation. Direct and inverse variation. Direct Variation Models. Direct Variation 1. Inverse Variation Application. Direct Inverse and Joint Variation. Direct Variation Application. Ex 1: Evaluating a function. Ex 2: Graphing a basic function. Graphing a parabola with a table of values. Ex 4: Graphing radical functions. Ex: Graphing exponential functions. Views of a function. Interpreting a graph exercise example. Interpreting graphs of linear and nonlinear functions. Quotient of Functions. Sum of Functions. Product of Functions. Difference of Functions. Evaluating a function expression. Evaluating expressions with function notation. Evaluating composite functions example. Evaluating composite functions. Introduction to Function Inverses. Function Inverse Example 1. Function Inverses Example 2. Function Inverses Example 3. Inverses of functions. New operator definitions. New operator definitions 1. New operator definitions 2. New operator definitions 2. Introduction to functions. Functions Part 2. Functions (Part III). Functions (part 4). What is a function. Difference between Equations and Functions. Function example problems. Ex: Constructing a function. Understanding Function Notation Example 1). Understanding Function Notation Example 2). Understanding Function Notation Example 3). Understanding function notation. Testing if a relationship is a function. Graphical Relations and Functions. Functions as Graphs. Recognizing functions (example 1). Recognizing functions (example 2). Recognizing functions. Relations and Functions. Functional Relationships 1. Recognizing functions (example 3). Recognizing functions (example 4). Recognizing functions (example 5). Recognizing functions 2. Domain of a function. Domain and Range of a Relation. Domain and Range of a Function Given a Formula. Domain and Range 1. Domain of a Radical Function. Domain of a function. Domain and Range 2. Domain and Range of a Function. Range of a function. Domain and range from graphs. Domain and range from graph. Direct and Inverse Variation. Recognizing Direct and Inverse Variation. Proportionality Constant for Direct Variation. Direct and inverse variation. Direct Variation Models. Direct Variation 1. Inverse Variation Application. Direct Inverse and Joint Variation. Direct Variation Application. Ex 1: Evaluating a function. Ex 2: Graphing a basic function. Graphing a parabola with a table of values. Ex 4: Graphing radical functions. Ex: Graphing exponential functions. Views of a function. Interpreting a graph exercise example. Interpreting graphs of linear and nonlinear functions. Quotient of Functions. Sum of Functions. Product of Functions. Difference of Functions. Evaluating a function expression. Evaluating expressions with function notation. Evaluating composite functions example. Evaluating composite functions. Introduction to Function Inverses. Function Inverse Example 1. Function Inverses Example 2. Function Inverses Example 3. Inverses of functions. New operator definitions. New operator definitions 1. New operator definitions 2. New operator definitions 2. Introduction to functions. Functions Part 2. Functions (Part III). Functions (part 4).